It did it again. 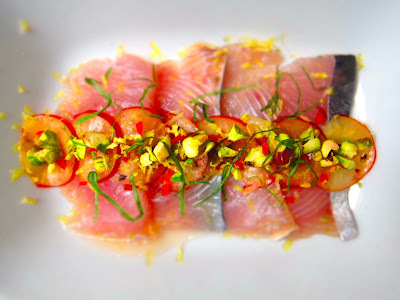 Freakin' MACKEREL. All the time! 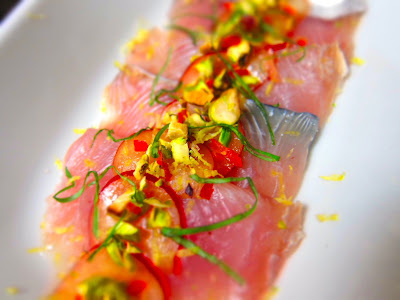 I think I try to mentally convince myself that mackerel is not near the top of my favorite fish list, but you know what? I'll give in. Definitely near the top of my list. SO GOOD! It may be because I once had bad, poor, nasty mackerel and it ruined me. But I've had it and cooked it so many times since with 100% success that I'll consider my prior thoughts faulty. Besides, mackerel is too good lookin' of a fish to hate it! Shiny, slick, silver, polka dotted. 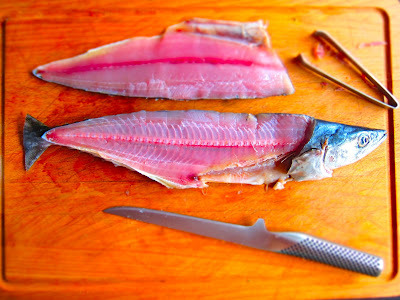 Anyways...this was such a good lookin' mackerel that I didn't have the heart to cook it. 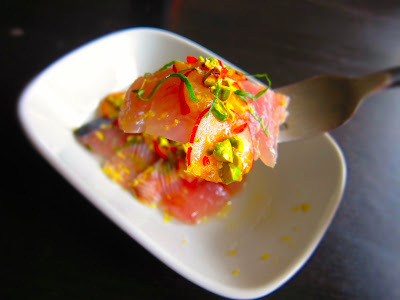 Crudo, baby! 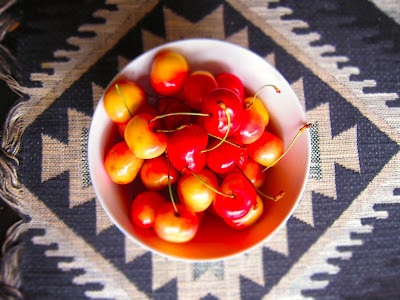 Inspiration #2 - Rainier cherries. Too pretty. I figured the cherries in this state may not hold up to cooked mackerel - so everything fell into place perfectly! Alright, so since this is crudo, there really aren't many "cooking" steps involved. It's more of just an easy mise en place of ingredients and plating! 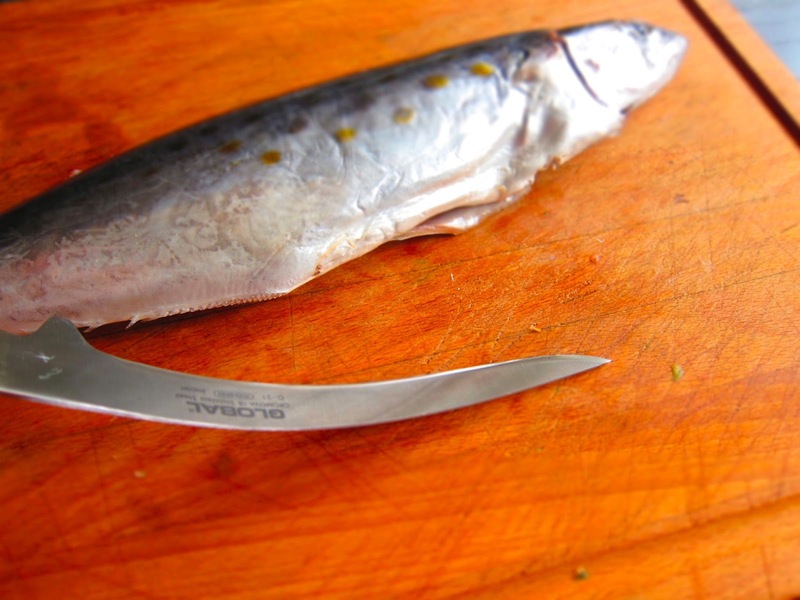 If you have a whole mackerel, start by filleting the fish. Ensure you have a super sharp knife, that also is flexible. Zing! Make sure to get all of the bones out of the filet as well. For the filets, I pulled out some sushi tactics. 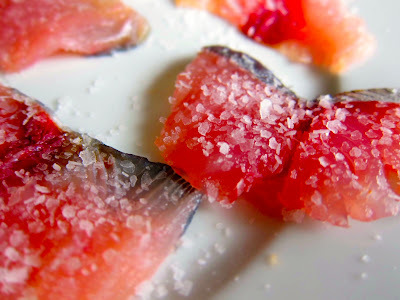 After thinly slicing, I did a quick cure with some kosher salt, just a couple of minutes, then 'washed' them with rice wine vinegar. Don't let the salt sit on the fish for too long, otherwise it'll get SUPER cured and overly salty. 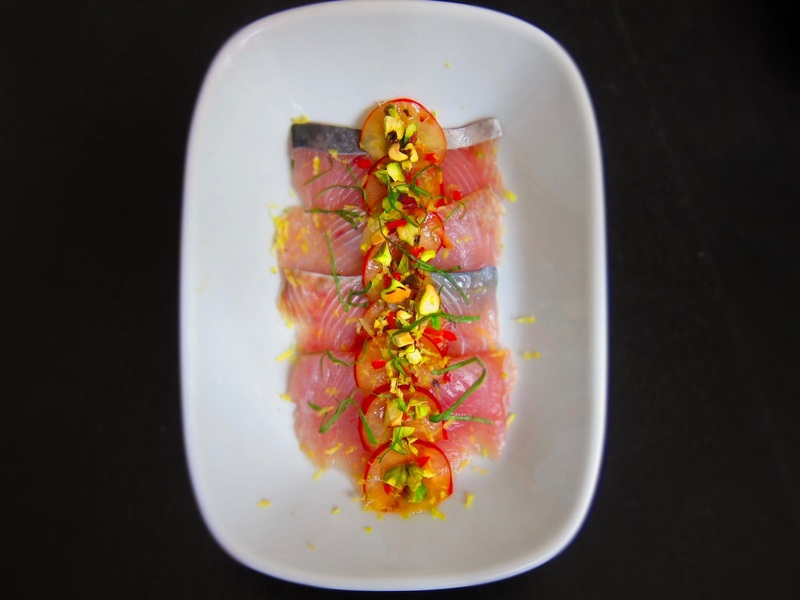 For plating, lay down about 4 or 5 slices of mackerel and drizzle with good olive oil. Lay down a strip of thinly sliced cherries, followed by pistachios and a little bit of the habanero. Finish with a good scattering of basil chiffonade, and zest the lemon on a microplane over each of the plates. Super simple, super fresh, super delicious! The fish took on a nice saltiness from the quick cure, but not so much that it overpowered the fresh ocean-esque flavor of the fish. This was balanced out by the sweetness of the cherries, and the brightness of the basil and lemon. The pistachios added a fabulous nuttiness (obviously), as well as a great crunch. The habanero gave it just the right kick to literally hit all the tastebud bases. This looks so great, I've been a long-time reader of your blog and all your recipes are gorgeous as well as delicious!